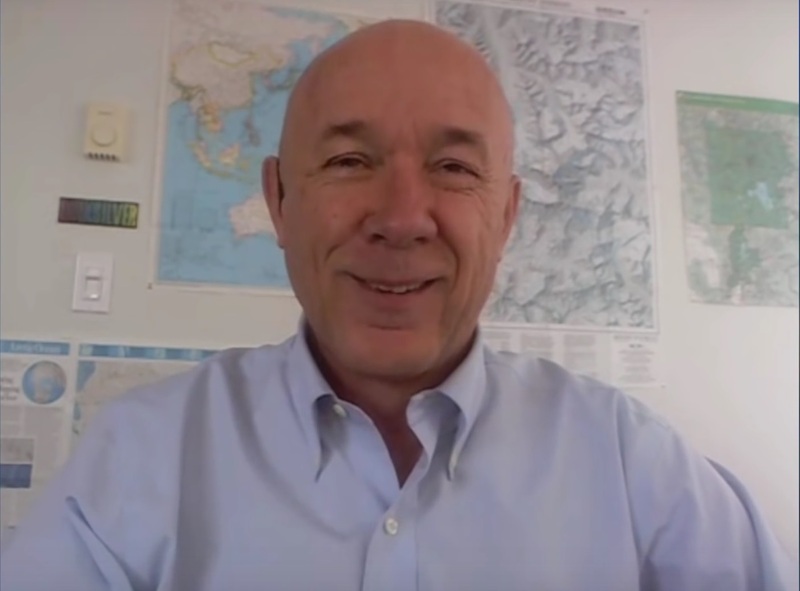 After subjecting Mickey Fulp to the intrusive and obtuse questions in the Proust Questionnaire, available here, we discussed how he invests in junior mining companies. You can find a recording of the entire interview here. P: Alright, if we can switch gears then I will read you some excerpts from your documents that really jumped out at me. M: OK. Hang on a minute, let me take a break here. M: Let me put on my thinking cap, since I’ve just been reading so far. P: Those couple sentences jumped right off the page at me. It made me think: Discipline. There’s a lot of discipline reflected in those statements. M: Yeah, I’m a pretty disciplined person. I have a program and I try to stick to it. When speculating in junior resource stocks, I strive to have no emotional involvement. P: So, that’s a great starting comment. And I would ask further, are there any additional things you would like to say about how that’s worked in the past or how it’s looking to you now. M: If memory serves I wrote that in 2009 and at that period of time, post global economic crisis, the world was, once again, the geologist’s oyster. We found many companies went very far, to the far corners of the earth, and took on geopolitical risk that eventually bit them in the but. And I got bit a couple times. Luckily, I exited most of the stocks that I speculated in where the countries eventually blew up. Examples would be Armenia, Haiti. Even countries like Sweden and Finland, which are normally looked at as very stable with secure mineral tenure had difficulties. Those sorts of geopolitical considerations change all the time. More and more, I am pulling back into my real realm of expertise and that is the Americas, both North and South. That said, I’m going to Finland in a couple of weeks! I’m writing about a company in Finland right now. Things change. It’s always a moving target. P: I saw that some related points came up in later documents where you talk about your philosophy and there really seems to be something there around your process. It was helpful for me to read about it and refreshing to hear that degree of specificity. It is more than I have heard from really anybody else that I can think of. M: I think you need to be nimble and quick in this junior resource sector. And be willing to change or modify your ideas, and question your ideas constantly. P: And so, if I can push on that a little bit, how much has your laser focus and intentions of being specific in terms of commodities, deposits, and countries -- how much has that caused you to write off or say no to things that you’ve come back to later and wanted to get more involved in. Or felt like you’ve missed out on something. M: Well, I commonly miss out on things. One of the detriments of being in this business, I’m talking junior resource sector for 25 years and not stepping out of this business, is that you learn the pitfalls. As time goes on, you like less and less, let’s say. So I miss things, there’s no doubt I miss things. But, by the same token, I have gotten in earlier and made bundles of money on things that ultimately failed, like the rare earth sector and graphite sector. And some of these bubbles where you know they’re bubbles, but you don’t always realize in the beginning how far they can fall. Once again, be nimble and quick. M: You ask about recycling, or coming back to things, I picked a company in 2010. We got our double in four days and then the company has fallen on hard times in the last years because of environmental or NGO opposition. Those NGOs got the ear of the court system in Finland and they have just beaten that back, so I’m recycling right back to this particular company. I am glad to mention it. You can use it or not, it’s Mawson Resources. I’ve remained a shareholder and they had a favourable court decision recently. It’s game on again! M: Coming back? Yes, some things go away and some things come back. You’ve got to keep an open mind. P: Yeah, I think “Know Thyself” might be a useful phrase that seemed to come up a bit when reading your stuff. M: Well, thank you. I think that is a compliment. P: Cheers, you are welcome. M: And I will modify that by saying: that still holds with the exception of companies I got involved with later, after I wrote that. By 2009-2010, I became intimately involved with a few prospect generators. So, that’s the other model. You need a flagship project. If you don’t have that, the business model of a prospect generator is attractive to me. I have been involved in several of those over the course of a few years. P: Thanks, that’s the direction I was heading in. I wonder if you see the rise of the prospect generator as a new phenomenon, or if there are precedents going back prior in your career. M: I know of two companies that have been running this model for a long time. In one instance since the 1980s and in the other since the early 1990s. P: I would imagine it is tough for them to come back to the market ‘hat in hand’ when investors may criticize them for being somewhat over-extended with having so many projects. If they can’t get partners to incur expenses on them, then the model can look quite bad, I would suspect. M: If it’s run right, and the two companies I am thinking of have run the companies very well, they’ve been able to generate enough cash flow through leasing, royalties, selling some of their projects outright to maintain good share structure for a very long period of time. You know, the prospect generator model in bear markets allows you to survive. All you’ve got for expenses is the general G&A and keeping your geologists in the field prospecting. I think it allows companies to survive the bad times and come back again during the good times. P: The ‘don’t go broke’ business model, as I’ve heard it described. M: Boy, that’s a good way to put it, Peter. P: Shout out John-Mark Staude there. Thank you very much, John, for that one. M: Yup, he’s one of them. For sure. P: Any comments on that business model and private markets? M: I think it would work great in the private equity sector. 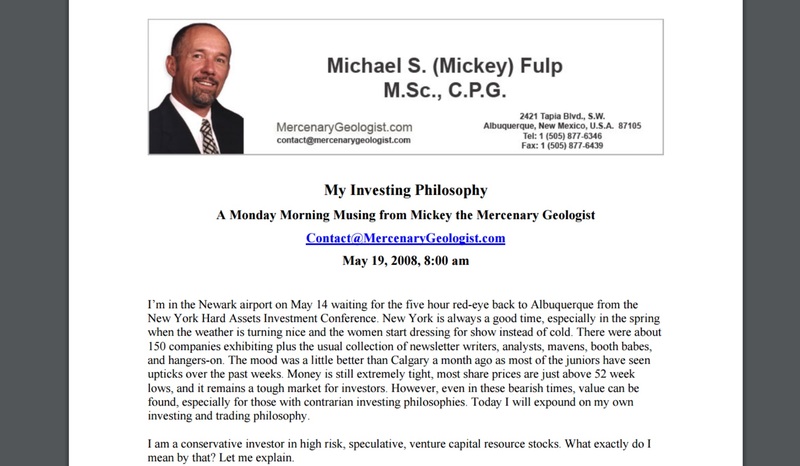 In fact, I know private funds that basically hire a team and say “You’ve got seven years, go out and find us stuff.” As a prospector at heart, and I really spent a significant part of my career as a practicing field geologist, say 30-35 years. Probably a third of that time, I was a prospector. And it’s an enjoyable profession. If you’re smart, you can be successful at it. P: I wonder, to what degree a staking spree would be a prudent use of funds given the low-cost of government license. And I wonder to what degree the available licenses are really picked over? M: That depends on the current state of the market and the jurisdiction. That’s how you make it as a prospector, you find something and you acquire the ground. Canada and the US are very favourable for that sort of thing because they have “English Mining Law” which means the Government doesn’t always own all the mineral rights, opposed to many other countries. So, you actually have claims and not just paying a government for the right to acquire mining concessions. P: Maybe one brief thought that occurs to me here. In contrast to what you were saying about specific commodities and specific regions, any comments on prospect generators that may have a hodgepodge? M: They can have a hodgepodge, but I think a successful prospect generator hires the right people with expertise in specific types or specific geographic areas. It really becomes a focus on those sorts of deposit types, commodities, and jurisdictions where you have a cadre of geologists who are the best in that particular deposit type, commodity, and part of the world. I think that’s key to it. M: Now, some of the larger prospect generators will initiate this process in several jurisdictions or commodities, but those are the bigger ones. Say, the ones that are listed on the New York market as opposed to the Venture. P: Sorry, one more idea that occurs to me as you mention the bigger guys. I wonder to what degree the rise of the royalty and streamers is a new phenomenon? 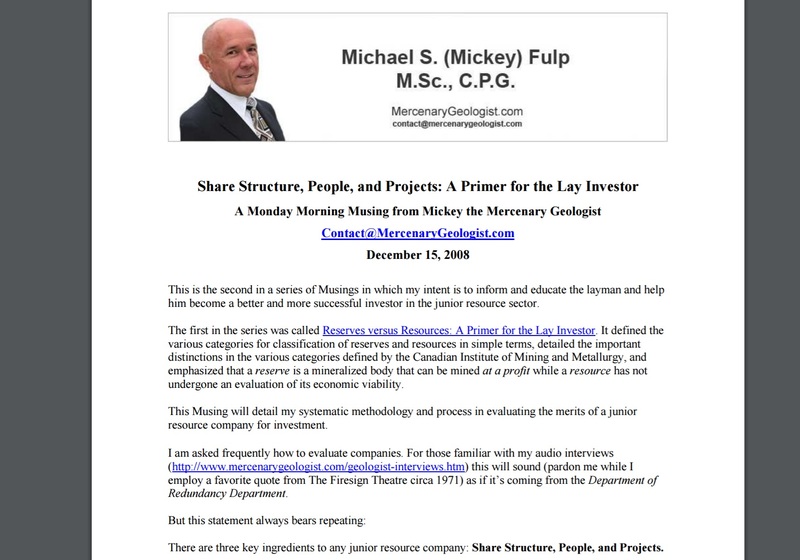 M: Certainly, I would say that the rise of the royalty companies and the streamers, although a couple of them like Franco Nevada have been around for a long-long time, the current rise in the last boom we had – what those companies did was, they were successful at the expense of the mid-tier gold miners who sold their profitability to the royalties and streamers. And that’s why the mid-tiers have not performed very well. M: An interesting marriage or melding is to combine the prospect generator with a royalty stream. There’s been a couple of companies that have done that successfully. So you have that royalty income, which allows you to fund your prospector. P: From what I’ve heard, Altius is taking a bit of an aggressive pivot in that direction. M: Yeah, they’ve been doing that for quite a while. They have that royalty at Voisey’s Bay, the giant nickel deposit in Labrador. They’ve been running that model successfully for a while. Eurasian Minerals is another that generates a nice royalty stream. P: I was on CEO.CA one morning and I saw “Oh, Altius has an earnings call in two minutes” so I called in and live-tweeted the thing on the site as it happened. One of the things that they said, was that they are really getting ready to vending out a large number of properties that they have. That was news to me and very exciting to hear. M: Yeah, that’s a well-run company. P: It would seem to be the case, yes. P: Great, moving on. Another quote that jumped out at me is: “I want an advanced play in a particular commodity, in a prospective geological environment, in a geopolitically stable jurisdiction with permissive size and grade to develop as a possible mine or attract acquisition by a larger company.” So, pretty straightforward sentence there. Yup, I would agree. Just to ask – everything still the same there? M: Yeah, I don’t think anything has changed there. M: That’s kind of the fundamental idea of how to pick successful companies. M: Bear in mind that this is written for my retail, lay investors/speculators, who I am trying to educate. I am basically a professional speculator. I only write-up the best of the best. Right now, I probably own thirty juniors. There’s not very many that would make the coverage list. The coverage list are really what I consider the best of the best. The no-brainers, with the “double and sell half” trading philosophy that we use. M: My risk-reward profile is much more skewed than I would recommend or promulgate to any speculator who doesn’t do this for a living. P: Given the week I have spent here in Vancouver, I would say that what I have heard you just say is the polar opposite of what I have encountered elsewhere. In that you are only willing to write up a short list of the longer list that you own, whereas I see other people that are willing to write up the long list and only really hold the short list. M: That may also have to do with the fact that I run a sponsor model. I don’t have a paid subscriber list. Which allows me to have about 6,500 subscribers and have a much larger reach because we syndicate to a number of other websites. The idea for us is market share and getting as many eyes on the pic as we can, with the idea that volume and higher liquidity makes for higher market capitalizations. P: And a little more robustness in future financings and all the good the things that come along with that. M: I’ll take fliers on stuff that I look and say “Well, it’s got the right promoter…”, and promoter in the good sense of the word, “right promoter and it’s timely – this thing’s gonna pop – and it just becomes a trade for me.” Those sorts of thing, they never make my coverage list. Absolutely not. P: That’s probably a good thing and I think some of the newsletter business would do well to take your cue on that to some degree. Moving on, you wrote: “I will ultimately examine those documents in detail and reach a preliminary decision on the project’s merits and demerits. If it passes my vet, which many don’t, then I get my consulting mining, metallurgical, and engineering colleagues to review the technical data and double-check the capital and operating costs. We must ascertain if the IRR calculations are done as per our conservative industry standards”. M: Realize that was done in 2008, so I’ve got a lot better at digging into that stuff. A lot of that work I do myself because I’ve become very astute at picking red flags, looking at technical reports, PEAs, feasibility studies, and I can go in and very quickly pick up red flags, fatal flaws, those sorts of things. M: I’m not afraid to do it, but I probably don’t do it as much as I did back in 2008. Which is eight years ago! P: Just flipping through your twitter and saw something about space mining there, very cool. M: Yeah, my girlfriend runs my twitter feed. She’s really on to all that stuff. I feed her some stuff about earthquakes and volcanoes and space exploration, those sorts of things that really float my boat – I really like. M: Yeah, I don’t know what to add. I will give you a little anecdote. In 1982, during my only significant tenure with a real mining company, that was Santa Fe Mining and I lasted six years there in the early part of my career. Sometime in 1982, I can’t remember exactly when, we got an Apple 2 computer. Who knows what it was at the time, but I was able to do iterative financial analysis. I was able to do a project and do an NPV on it and then go and change the discount rate or change the commodity price. From the get-go, the business development guys and I did evaluations. Their mantra was ‘lowest quartile, we have to be in the lowest quartile of producers’. And it stuck with me. It’s necessary. P: An idea that it triggered with me is something that came up with me at a pizza party with the CEO.CA crowd. Martin Turenne from First Point Minerals mentioned it, it has to do with the supply side getting more crowded as metal prices rise. P: With the optionality plays, there’s a lot of hype around that. When metals prices rise, you can really see a lot – a lot, a lot – of production come online. And I wonder to what degree that can be self-defeating in a way. M: Yes, it absolutely is, Peter. We saw it post-global economic crisis. It became game-on in our sector. In the first part of 2009, it started with the major gold miners raising huge amounts of capital. Newmont did it, Barrick did it. By the end of January, it filtered down. Osisko, which at that time was just a gold developer ‘wannabe’, raised four-hundred million bucks. By April, it trickled down to the smallest juniors and you saw what happened. It was a commodity-wide thing, a bit, driven by massive infrastructure build coming out of China. China chose to build infrastructure and create jobs and spend money as a way to get itself out of the economic crisis, whereas most Western governments did so-called Quantitative Easing and depreciated their dollars. That led to a huge demand for all commodities that was not sustainable. We saw the results of that starting to appear in 2013 and the bottom was reached, arguably, at the end of 2015. Self-defeating, you know. M: Supply-demand fundamentals are generally pretty tight. It goes one way or the other too far, then it corrects, and now we’re coming into what looks like a bull market. And we’ll do the same thing again. In a way, it’s the way capitalism works. It works in booms and busts, it’s just exacerbated in the mining industry because it’s such a capital-intensive business. Oil and gas, too. Booms and busts. P: The lead and lag times involved really amplify that stuff too. M: True, very true. Good point. P: I’m sure we could chat for an hour about that. P: I will move on to another one of your documents from ’08 that I enjoyed very much. It was “The Problem with Geologists” (link). M: I enjoyed writing that, perhaps, as much as any other. P: There are a few – maybe three things – that you wrote there that I wanted to mention back to you and check in. The first is “The junior exploration and mining business is entrepreneurial and driven by type-A personalities. It runs on high-risk venture capital and the best geologists are the ones who can span the bridge between a bush camp and a corporate boardroom.” You went on to talk about how that was hard for a lot of geologists. And I wanted to ask if you think that’s changing with the next generation, maybe. M: Nope, not at all. My concern with the next generation of geologists – it will be different, it will be different because they are graduating without these skills in the field that were requisite in my generation of geologists. Lots of them come out and they think that being a geologist is sitting behind a computer in an office doing GIS or this and that. But the best geologists in the world are the ones who put on their boots and walk around and live in bush camps. My concern is that the next generation is not as field-savvy as my generation has been. They may be better off in the corporate boardroom, but it takes both. M: Yeah, I think I exaggerated that. I think I would say four out of five fail, four out of five trade dollars, and two generate windfall profits. It’s a tough business – mining is a tough business. P: I think we are familiar with hearing the nasty statistics around exploration success, but to hear the same kind of 80-20 rules applied to actual development and production is somewhat new and gravely concerning to me, at least. M: Well, look at the failures that have populated the gold mining business since 2003. I did a seminal piece, 4,000 word expose developed from a white paper that was 8,000 words by Cipher Research called “The Real Cost of Mining Gold” and it is pretty thick. You got to understand finance and be able to read a financial statement to get through it. But the gist of it is that we took seven gold miners, from ’03 to 2013, an eleven-year period during the biggest gold boom we’ve ever seen and none of them were profitable. It’s really an indictment of major gold mining. If you’ve got some time for bedtime reading then take that and fall asleep a couple of nights. M: That was called “The Real Cost of Mining Gold” and we followed that up with “The Real Value of Gold in the Ground”. We’ve got one in the can right now that is in post-production edit on the video and it is called “The Real Cost of Growing a Gold Miner” and I have alluded to before the royalty companies that have taken all the profitability from the mid-tier producers. The next one we’re going to do is the royalty and streaming companies. We don’t have a name for that yet, but it will be called “The Real Something of Something”. P: That’s amazing. Very interesting to think about where the profits get allocated across the industry. M: Absolutely. So, I’ve written two musings on that series. There’s also a set of three videos that are on my website, but are also syndicated to GoldSeek, Peter Spina. We do a series of three videos on each of those newsletters. Sort of an indictment of our business. M: If you dig into the profitability of these companies – the major gold miners are basically doing equity financings and taking on debt to declare dividends to shareholders. “Robbing Peter to pay Paul” sort of thing. P: It makes me wonder: is small beautiful? M: The trouble with small is that you can’t generate enough cash flow to get ahead, to develop your additional reserves and do exploration. Small is a tough way to go too. Bottom line is: you don’t want to be a miner. I don’t want to be a miner. I want things that have exit strategies. I own three or four miners and I probably made money trading the stocks, but are they ultimately profitable? Not unless you trade. Small miners don’t give dividends and that’s the problem – they can’t, they don’t generate enough cash flow to do that. P: Given how much we pin our hopes, in the junior game, on acquisition by seniors, to have the truth laid bare about the seniors is a little concerning. M: Well, I think you don’t want to own the seniors. A successful junior will have several exit strategies. The idea that selling to a major is your only exit strategy – that doesn’t work very often. You want to have this ‘multiple exit strategy optionality’ but, generally, when something gets taken out, it’s generally taken out to a premium – a significant premium, 30-40% of current share price – and I want to take the money and run, to tell you the truth. I don’t want to be a shareholder of Newmont or Goldcorp. M: Or Kaminak gets taken out by Goldcorp, that was a 30 or 40% premium on current Kaminak share price. I would have sold those shares that day. The only reason to hold on is if you think there’s gonna be a competitive bid. So far, we haven’t really seen competitive bids. P: It’s not really that frothy, is it. M: No, Nevsun and Reservoir – they had to sweeten that deal a bit. But the other thing we haven’t really seen is significant amounts of cash. They’ve been mostly all-share deals. P: And maybe one of the last quotes from the problem with geo’s document is: “My desire is to make you, as a lay investor, a better investor with a higher rate of success. By making good investment choices, you will make money in the junior resources market, continue to invest, liquidity will increase, volumes will be higher, and our micro-cap stock market will thrive.” Again, a good rallying. Just to confirm, that is still your M.O.? M: Yup, that’s what I’m in the business to do. P: The last document that I had some quotes from was your “Investment Philosophy” (link). M: I would probably modify that comment to say that “I challenge you to find a junior that does not have a double from it’s low to it’s high in any given 52-week period.” They all do. So, it’s incumbent on us to buy them as contrarians when they are unknown, unloved, unwanted, and under-valued, and sell them when they’re active and the flavour of the month. P: Any comments in regards to the heavy selling that can really drive price down quickly with heavy volume and low prices. M: There are a variety of reasons that happens. What you want to do is be a contrarian and get in that selling early. These stocks are designed to be traded. They are not long-term buys and holds. Buy and hold philosophy is going to lead a speculator to lose most of his money. You need to be ahead of the curve on those sorts of things. It’s tough for a lay investors, lay speculators, whatever you want to call them, to savvy all that goes in the market. And that’s why I think you need help as a lay investor. Hell, I need help as a geologist with engineers! We talked about that, so find a newsletter writer that has a good track record and listen to them. Listen to them and then do your own due diligence and research, and make your own decisions. Don’t depend entirely on newsletter writers, but I think you can get good ideas from my sector, if you will. M: Yeah, so the bear market turned around and a lot of those open orders to sell, I just gave up on them. As we are coming into a bull market, I am increasingly putting in orders to both buy and sell. By doing that, especially on the sell side, you can often have the highest trade ever. I can go away and put something in – say I want to sell half of my position, or a portion of my position at 98-cents and I go away. Then, all of a sudden, it spikes to 98-cents and I come home and I’m happy. Don’t even know that I’ve traded. M: Oh, well that’s good. I never thought of it as the only way, but by that methodology, you are taking all of the emotion out of your trade. You kind of want to be a robot, not think too deeply about this. P: And why do you think more people don’t have standing orders on both sides of the markets on these companies? M: I think people are enamored with the idea that they are gambling. People operate on emotion, markets operate on emotion. Look what happens when Yellen gets up and surprises people with a rate increase or when they expect one and don’t get it, markets just go crazy for a while. You want to be unemotional. Especially in the junior resource sector. It is gambling. You should never do it with money that you cannot afford to lose. But I think some people just get a thrill out of playing the game and I think that is the wrong way to approach it if you really want to make money in this business. P: And speaking of the business, have you ever encountered people who have market-making strategies on these juniors? M: Yeah, well – you what do you mean there? P: Well, quoting both sides of the market with a high degree of commitment. You don’t have to be close to the last price, per say, but to hold an inventory of stock and to post up bids everyday and have some offers sitting out there as well. Just to be a patient provider of liquidity. M: Yeah, I certainly know people who do that. That’s kind of the function of brokers, who are managing their clients – to help create markets. Am I going someplace wrong with it – maybe I don’t quite understand what you’re trying to get to here. P: I feel like brokers are bit more prone to bid at the market or maybe use a market order, even. And I wonder about the hedge fund types, with the rise of high-frequency trading. What about low frequency trading? M: (laughs) Well, a lot of my philosophy has evolved, over the years, from some brokers that I’ve had. My brokers are my friends. My brokers are people that I chose and get to know. And the guys I meet for beers after work. The whole idea of selling half after it doubles came from my original broker in this sector, who is still at Haywood. My love of picking unknown start-up deals, which is really my sweet spot right now, comes from him. Brokers are my best friend. Anybody that manages my money better be my friend. P: “They better be your friend”, right? Doesn’t that just – I’m with you one-hundred percent. M: Yeah, and to tell you the truth, I don’t use brokers – I use full-service brokers for their ability to trade smartly. Most of the ideas generated are mine, but the buys and sells – I call up a broker and say “Hey, I want to get rid of this position in this range, you trade it and get the best you can for me.” Then I don’t have to worry about it. I don’t have to sit there and look at the market, all I have to do is look at the end of day and see if I traded or not. P: Yup, there is a lot to that that is refreshing to hear. Given all the people sitting at their computers these days watching every tick. M: Yeah, it’s just not something that I want to do, chose to do, have the time to do. Doesn’t interest me that much. P: Well, I appreciate you taking the time with me today. Just a couple more quotes that I wanted to run through. P: “It’s an infallible way to make money in a bull market. Buy a stock, sell half when it doubles, and take that money to go buy another stock which has a strong chance of doubling in twelve months or less. Keep doing that and watch your profits and tax burden soar.” Just wanted to ask if that is business as usual for you? M: Absolutely. During the depths of the bear market, I had to reduce my goals on trading stocks because time and time again the 52-week high was in January to mid-March and it was downhill the rest of the way. Now that it is getting better, it is game on again. P: Is it really always half or is it ever more than half or is it really that robotic discipline? M: Well, sometimes things are rising so quickly that I will hold off the double and try to get a triple out of it or something. You’ve got to look at the market and the trading patters. This philosophy is really geared towards people who subscribe to my newsletter. As a professional investor, I am prepared to take more risk than I think that my average subscriber should do. I’m trading a stock and I’m in for a five to six bagger, but that’s because it was basically a shell that came running out of the gate. I’m trading it at these levels because I can. Basically, trying to take money off the table. M: This is not a hard and fast rule, it’s just a way that I can generate success for my subscribers. P: What was the quote? “I made a great fortune selling to early”? P: Yeah, what a problem to have. M: I love that quote. M: Absolutely. These are just guidelines. Every person has got their own way of doing it. I think, more than anything, you’ve got to be unemotional. Don’t let emotions get in your way. Take a deep breath, walk away, and think about why you bought this particular stock. Try to be unemotional. M: Fear, greed, panic don’t belong in the stock market. If you can take those emotions out of your trading pattern – if you think about it, it’s really two emotions: greed and panic. You’ve got fear of a falling market behind panic, and fear of missing out on the next big thing behind greed. If you can take those emotions out of your trades, then you will be much more successful. P: It makes me wonder about all the things you’ve seen since writing this back in 2008 – people developing their own style or flailing around and not developing their own style, as the case may be. M: There are some people who are smart in this business, or they learn easily. And there are other people that make the same mistakes and don’t quite savvy – there’s dumb money in any market, but especially in this market. There’s a bunch of dumb money and those people get burned again. Yeah, develop your own style. This is just a guideline. Even for me, there guidelines and I break my rules. What I try to never do is get emotional – not always easy, but that’s what I strive towards. P: I would expect no less than for you to break your own rules. M: They are nothing more than rules of thumb. You need to remember that. They are rules of thumb and nothing more than that. Rules are made to be broken. Thanks to Mickey for the engaging discussion. You can find all of the documents that we discussed and much more on his site here.